Onsite parking spaces are reserved for residents of the presbytery building. Parking is available in nearby streets but please respect residents’ parking restrictions. Alternative parking can be found in in the council car parks in the nearby town centre. 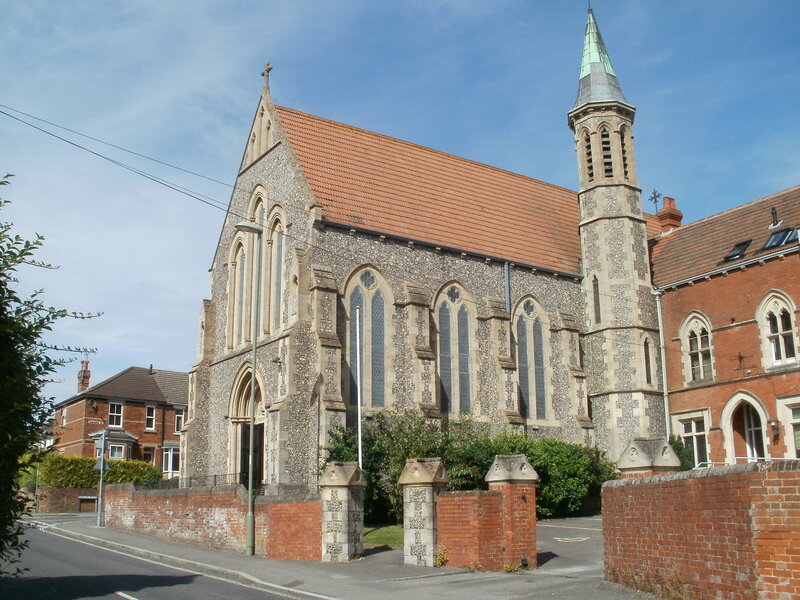 Holy Ghost church was built in the early English style by Canon Alexander Scholes and consecrated in 1903 by Bishop Timothy Cotter. Canon Scoles is buried in the church grounds and his memorial headstone is on the north side of the church. The materials used throughout the church are flint with stone dressing. The large stone buttresses surrounding the building contain statues of the patron saints of our diocese and John the Baptist. 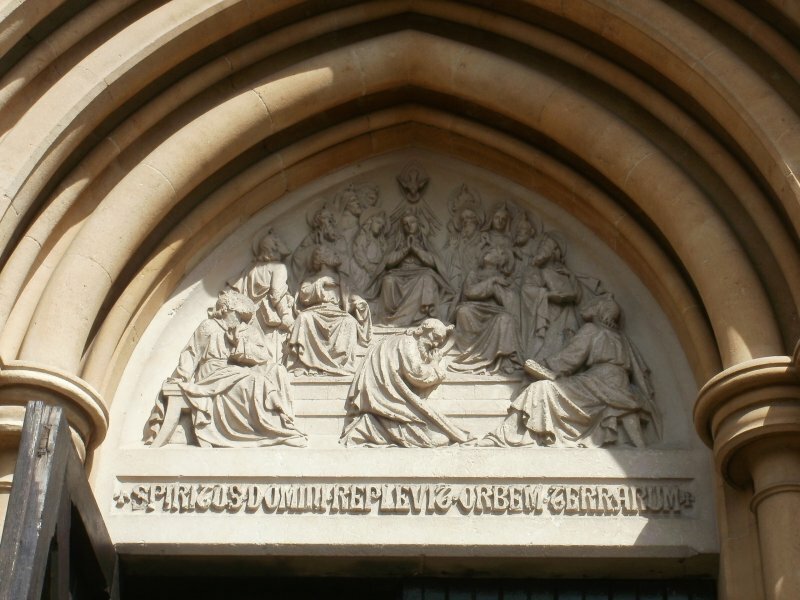 Above the front door is a stone carving representing the coming of the Holy Spirit on the disciples. The paintings on the ceiling above the altar show Jesus on his mother’s knee, the seven spirits of the Old Testament and John the Baptist. Surrounding them are scrolls bearing the words of the hymn Come Holy Ghost, Creator come. 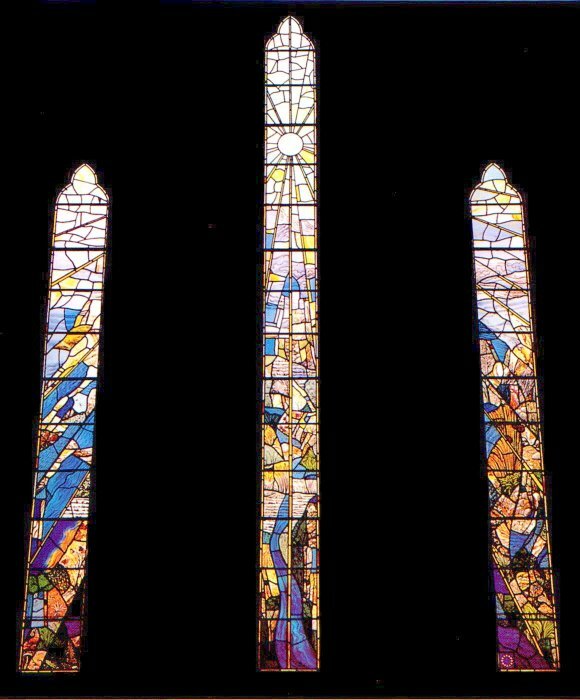 Four of the church’s windows contain images of the gospel writers, St Joseph and Pope Alexander I. 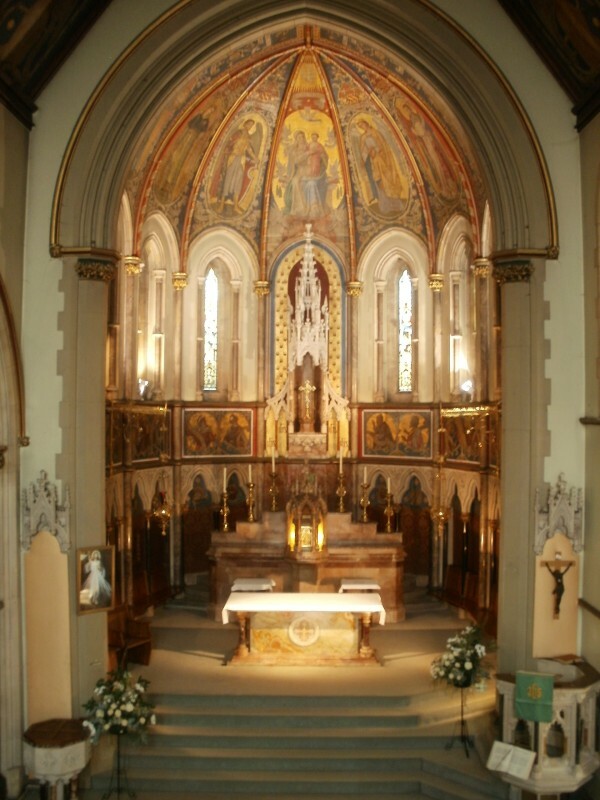 The altar is made of marble and contains relics of St James, St Stephen and St Bede. The Lady Chapel on the left of the church is decorated in blue and gold and contains a marble statue of Mary. 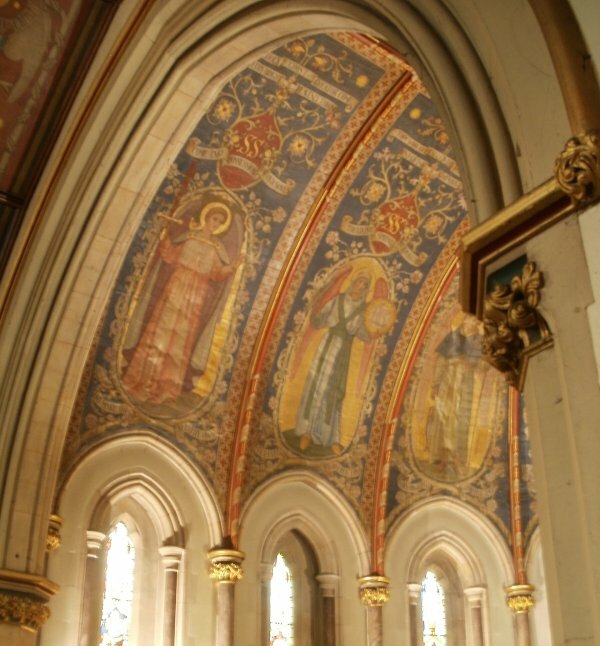 On the walls and celling are various paintings of events in her life, including the arrival of the wise men at the manger, the wedding at Cana and Mary’s assumption into heaven. The bell tower contains the bell called John, sponsored by John Liddell of Sherfield Manor. It is inscribed with the words “Glory to the Father, and to the Son and to the Holy Ghost”. In South View Cemetery park, between the church and the rail station, are the ruins of the Chapel of the Holy Ghost. The original building was built in the 1200s as part of the cemetery. 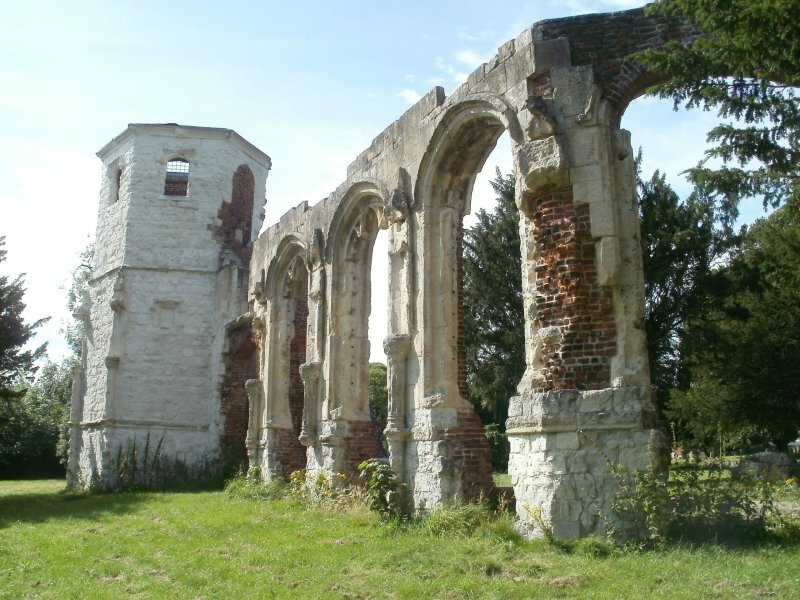 It was enlarged in the 1500s by Lord Sandys of The Vyne, when he added a chapel to the south side of the building as a burial place for his family. It is the ruins of his later chapel that still survive today. Lord Sandys is buried in the grounds.